As soon as we took the first bite at our initial tasting, we knew Eleven Courses was going to be our caterer. Each member of their team is dedicated and committed to meeting every need of your event and strives for perfection in all that they do. During the process leading up to the wedding, we had total confidence that Eleven Courses would make our wedding a day that we would never forget. On the day of, we were treated like royalty - one member of the crew even ran after us riding away on a golf cart carrying a plate of hors d'oeuvres in the rain. All of our guests were asking who our caterer was before dinner was served. We can't say enough nice things about this company! You will be impressed by how professional and how pleasant these guys are to work with! If we are ever in a position to cater an event, Eleven Courses will absolutely be our choice. Eleven course was amazing for my wedding this past weekend! The quality of food and the price was exceptional! 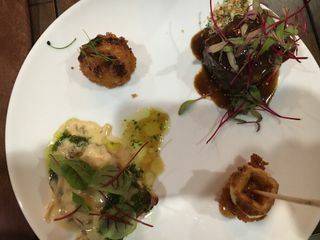 We went for a tasting and had the short rib, boscaiola chicken, chicken and waffle appetizer and fried Mac and cheese appetizer. They were all amazing and we decided to go with everything we tried for the wedding. Janae was amazing to work with! She was so helpful through planning the whole wedding and helped me choose linens table setup. She made everything go so smoothly for the wedding! The hors D’oeuvres were amazing! I wish I ate more! The bacon wrapped scallops, chicken and waffle and fried Mac and cheese were the best hors D’oeuvres I have ever had at a wedding! We got so many compliments on how great the food was! For your wedding don’t hesitate to hire eleven courses! We will be using them for any future events or we have! Eleven Courses was very responsive and helpful every step of the way. The staff was friendly & attentive. The food was delicious. Our wedding guests loved the appetizers & dinner. Everyone had a great time! Our overall experience was fantastic! The staff was very responsive through out the entire process and would always answer my emails in a timely manner. They were very flexible with catering options and we like how different their menu was compared to other more traditional wedding food. Our guests thoroughly enjoyed our wedding food and they were even able to accommodate our request for a signature drink for the bar. Would overall recommend! I am not big on reviews but for this company I just felt like I had to say something about the amazing experience we had working with Eleven Courses Catering! They recently catered our formal alumni event held at the Dumbarton House in Georgetown. First, we had no idea as to who to use for catering when planning an event in Washington, DC. We received a list of caterers from the venue and started the process of reviewing menus and talking with people regarding the event. After narrowing it down to a final four I spoke with all of them about menus, pricing, and service. As soon as I spoke with Melissa Benson, the owner, I was sold and we quickly signed a contract and proceeded with choices etc. Throughout the process, they were amazingly helpful in terms of responding to questions as well as making suggestions! Last Friday evening at the time of the event, the staff arrived on time and immediately turned the venue into a truly magical place, taking care of all the details. Once our guests arrived the service was impeccable and the staff professional, helpful, and very nice. Finally, the food, from the Black Tiger Shrimp hors d’oeuvres to the filet and the amazing crab cakes was as good as the best restaurants’. We had over 70 attendees and all of them had great things to say regarding the quality of the food and service! In closing, Eleven Courses is the third or fourth caterer that I have used and hands down they are the best. They have our absolute highest recommendation and we would most certainly use them again! Eleven Courses catered our wedding this October, and we were so happy with the whole team! I (the Bride) have Celiac Disease, and in selecting a caterer it was really important to me to find a vendor that truly understood my dietary needs since I would have been devastated if I had gotten sick at my own wedding. Not only did Eleven Course understand my needs, but they suggested making the entire menu gluten free. To say I was impressed, relieved, and overjoyed would be an understatement. In addition to putting me at ease about my own needs, they were so easy to work with and thoughtful about the dietary needs of our guests as well. At our tasting we were able to meet Jim, the Executive Chef and Owner, and Shaun, the Chef. They were kind and welcoming, and made us feel comfortable. The food was beautifully plated, and most importantly, delicious! We had a really hard time narrowing down our final selections because we knew everything they offered would have been amazing. At the wedding the food was just awesome. We selected Irish Potato-Leek Soup Shots, Korean BBQ Beef Tacos, and Lobster Rolls for our passed hors d’oevres during cocktail hour and I would have been ecstatic with just that (seriously, I could eat a gallon of the potato-leek soup). Finally, the entire team was just a pleasure to work with. I felt like I asked a million annoying questions and had some last minute changes, but everyone was so supportive and easy to work with. Janae and Emily were always very responsive, and I felt like we were in great hands. I felt so well taken care of when a whole tray of hors d’oevres appeared for us during our sunset photos that happened concurrent with cocktail hour. We had said how important it was to us that we actually get to eat, and the team really went above and beyond to make it happen. I can’t say enough good things about Eleven Courses and highly recommend them! Amazing food, great communication, and flexible service! I found Eleven Courses on wedding wire and am so glad I did! Working with them was a breeze. They are so responsive, helpful, and accommodating to ANY request or idea you have. The food was delicious and my husband and I really appreciated how Melissa made sure we got to eat at the wedding... from bringing drinks and o'dorves to where the bridal party was taking pictures to getting my husband an entire extra meal at our reception just because he asked for one, she took GREAT care of us! Not to mention their prices are far more competitive than other Baltimore-area caterers. Could not recommend Eleven Courses enough! Eleven Courses Catering was my dream catering team. From the moment I met Jim & Janae (in the green room for a tv spot!) until we were eating the last donut and walking out of the venue was a breeze. Melissa and Janae were amazing points of contact, answered every email quickly and went above and beyond to make sure that our wedding day was the best day of our lives. The food was AMAZING and the fact that ECC made an entirely dairy free menu to ensure that I could eat everything on my wedding day was so incredible. I also was not expecting our caterers to place our rental order but Melissa and Janae made that process super simple as well which was greatly appreciated. Finally, when a mix-up happened (on my end, not Eleven Courses fault) and my Mom was unhappy, Janae solved the issue with a smile on her face and never complained once even though she wasn’t at fault. She wanted it to be the best possible day for all of us and did whatever needed to be done for that to happen. I appreciate that more than I can express. We love you Eleven Courses and THANK YOU for an amazing experience! Eleven Courses was fantastic in every way. From the passed apps, to the stationary dips, to the buffet dinner, to the plated desserts -- their food was incredible! Such a good value too. We were able to get all the dishes we desired and actually stayed within our food budget (which, in the DC metro area, is quite the feat!). My favorite part of working with Eleven Courses was the people. From our first interaction, Jim was friendly and responsive and flexible. I felt like we were working with a friendly neighbor. Janae was our coordinator for the event and she was the bomb. Such a great sense of humor and she had it COVERED. The wedding went off flawlessly and we are so grateful. I can’t say enough great things about Eleven Courses! They were the first caterers we sampled and after trying a few others we just knew no one could top them. Jasmine and Janae were my main points of contact throughout this process and they were both so amazing with having all the answers for me anytime new questions came up. After talking about budget and what types of foods, I was sent an estimate with a menu that had a huge variety of choices. We wanted a Southern theme since I am from GA and my husband is from Southern MD and it just fit our personalities. The appetizers were chicken & waffle bites, fried green tomato sliders and bbq pork wontons. All were amazing! One thing I really loved about Eleven Courses was that while my husband and I and the wedding party were getting photos taken and missing the cocktail hour, a catering staff person made sure to bring us our signature drinks and trays of the appetizers to us all while doing photos. That was so amazing and helpful to stay fed throughout the process! When we got to our table at the bride and groom place settings, our food and signature drinks were there waiting for us after the first dance. We had a buffet so it was nice that we didn’t have to go through the buffet line! The entrees we got were Chicken Milanese and Braised Short Rib. I highly recommend both! We got rave reviews from our guests about the food and are still hearing how good the food was! We went with the full bar package and it was totally worth it to not have to worry about acquiring liquor, beer and wine and then having to take whatever was leftover so if your budget allows for it, I highly recommend going this route. My signature drink was a peach sangria and the bartenders made it perfectly! My husband doesn’t drink so he chose a bottled cream soda, Stubborn Soda, and that was the only thing we purchased separately. Their professionalism and quality of food and service is unparalleled and worth every penny! Eleven Courses was everything and more! We worked with Janae and she is just beyond wonderful. This company is so easy to work with and they are extremely proficient in managing during the event. Not to mention the food. All of our guests were absolutely raving about it. We also wanted a specialty cake and they were able to provide that as well as specialty meals for our diet restricted guests. Look no further you have found your caterer! Loved everything with this vendor. The food was delicious, gorgeous!, plentiful, and many people asked for their contact information after! I can't recommend Jim Benson and Eleven Courses highly enough. We planned a wedding for about 150 people on a fairly limited budget. Jim and his team were wonderful from the very start. My husband is a chef and was very specific about what he wanted for food. Jim and his team were flexible with our specifications and gave us everything we asked for at a very reasonable price. The food presentation was impressive, and everything tasted delicious. Jim and his team are also extremely experienced and truly cater to their customers. We had a day-of planner, but we ended up counting on Jim predominantly to give us an overview of how things are handled at our venue and what would work best logistically. Everything went seamlessly the day of our wedding and everyone commented on how spectacular the food was. If you are looking for a professional company that will provide a top-level product and work with you on cost, Jim Benson and Eleven Courses deserves your business. You won't be disappointed. We were so pleased with Eleven Courses. They were willing to work with our budget and help make our wedding perfect. Guest still (3 months later) talk about how delicious the food was. Every little detail that they were in charge of was absolutely perfect. The staff was kind, professional, and responsive! You won't regret going with Eleven Courses! I have to say, I don't usually rate anyone perfectly. However, working with Eleven Courses was truly the best experience. Not only do they provide exceptional customer service and final products, but they were also a pleasure to work with and so flexible in accommodating our asks and making our vision a reality. We had a custom menu that we worked directly with Jim to hone the family Indian recipes and make them something perfect for our blended family. If you are looking for a caterer for any event, big or small, I highly recommend working with Eleven Courses Catering. You will receive great value for your investment! Eleven Courses was one of the best decisions we made for our wedding day. They go beyond the catering to make everything from the set-up to timeline run smoothy and were very attentive throughout the event to make sure we were happy. Megan and Melissa were our contacts throughout the process and both were timely with responses and flexible with giving and receiving information. The big plus was the amount of positive comments we received from our guests about how good the food was! Our photographer even said "that was some good chicken, and I've had a lot of wedding chicken!". Eleven Courses was also super accommodating to our needs and wants and made the experience so much more pleasant. We would definitely recommend them time and time again! I couldn't be happier with using Eleven Courses for my 9/2 wedding. When my husband and I tasted the food, we knew we wanted Eleven Courses to cater our wedding. 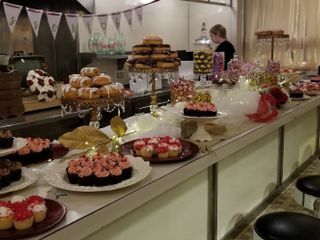 They were so accommodating of our multiple requests, especially wanting to use an alternative dessert option (donuts and cookies) and keeping up with the many detail changes that happened as we needed to move our wedding indoors. My guests are still raving about the food and the service was top notch. The best part was that one of the waitresses continued to seek my husband and I out during the wedding to make sure we got to try all of the food, even when we were taking pictures. Thank you Jim and Eleven Courses! I cannot recommend Eleven Courses more. I worked with Megan as my coordinator and she was such a delight! She was very professional and easy-going to work with and answered all emailed questions quickly--I can honestly say that throughout the process I felt I was in good hands. I never felt uncomfortable asking about pricing or any strange questions or requests we had and the guidance Megan provided was much appreciated. We traveled a couple hours to Owings Mills, MD (we live in Springfield, VA) to attend our tasting at their offices. We met Jim and Megan in person, and the tasting decided it for my husband and me. We immediately knew these were the caterers for our wedding. The food was incredibly delicious and now, several weeks out after the wedding, our guests are still talking about how tasty everything was. Their prices are amazingly reasonable, especially given how beautifully presented and delicious their meals are--they have an affordable price point, however, the service and food delivered is that of the super-pricy, high-end caterers (services which I often use in my firm and am well-familiar with). 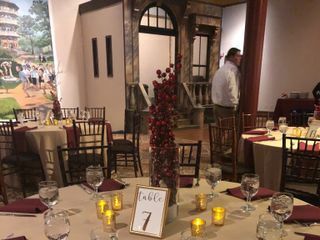 It was very much appreciated how they didn't nickel and dime us and were proactive in helping out and finding ways to make the wedding special. We consider ourselves incredibly fortunate to have hired Eleven Courses for our caterers and intend to hire them again, should we plan another huge celebratory bash. My family and I cannot say enough about this catering company...when my first catering company fell through three months before the wedding, we were relieved to find Eleven Courses available to cater our wedding in February. When we further complicated things by having a series of weddings in my family this year (three, yes - 3!! ), they were more than happy to help all of us plan our weddings. For our wedding, Megan and her team did a fabulous job of working with our limited schedule to get tastings in, respond to several last minute changes and very strict dietary accommodations for a select number of guests to really bring everything together. Day of service was absolutely fantastic - from the food to bar service, set up and take down we are so happy to have found this gem of a company. Jim and the whole team are wonderful!! 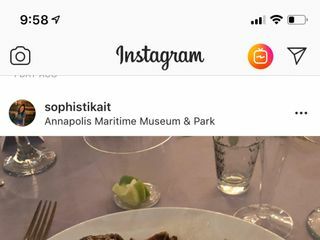 Eleven Courses recently catered my son's wedding (they also catered my daughter's wedding) and both times they hit a home run. The food, service and attention to detail was simply impeccable. Jim, Megan and the rest of the team were so easy to work with and overly flexible as we constantly things around. Highly recommended! Melissa was fantastic. She worked with our budget and provided a great team who was on time and friendly. The event logistics were changed several times but she and her team went with the flow and provided amazing food and warm and easy atmosphere. I would use them agin for a small affair or large. It was easy and drama free. My husband and I made the very scary decision to end our contract with our caterer 6 weeks before our wedding. I felt like any work that had gone into planning went out the window. 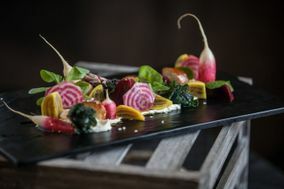 I was quickly drawn to Eleven Courses when I read a review containing a similar situation as ours and that Jim and his team were able to pick up the pieces and knock it out of the park for this other couple. I second the emotion and remarks of that first couple. Jim Benson took care of us and even suggested other reliable vendors. Someone at our wedding described the filet of beef "not wedding beef" because it wasn't run-of-the-mill, and tasted top-of-the line. Towards the end of the planning process and now, a few weeka post-wedding, we keep saying that firing the first caterer was the best decision during the planning process. Thank you to Jim and his staff for all they did to enhance an already magical night. All I can say is WOW! Jim and Melissa from Eleven Courses went above and beyond all of our expectations. Unlike other caterers, they did not nickel and dime us the whole way through. They were very willing to work with our budget and offered suggestions for how to keep it in check. They even offered options and advice outside of their services to help us. They met all of our special requests and made special exceptions for what we needed. The day of- boy, did they deliver! Everyone raved about how fantastic and unique our food options were- like buffalo chicken egg rolls and mini chicken and waffles! I heard so much about how delicious everything was all night. The Eleven Courses staff made sure my husband and I were satisfied throughout the entire evening. Jim Benson, who was very familiar with our venue, even helped organize other aspects and put out a few fires for us (that we didn't even know started!). Above all, what sets Eleven Courses apart is that they CARE about the people they serve. They wanted us to have an amazing night and did whatever they could to make it happen. THANK YOU Eleven Courses. If you are thinking about hiring this professional and outstanding team, don't wait. You won't regret it.